Omar Chavez Santiago is twenty-four years old. 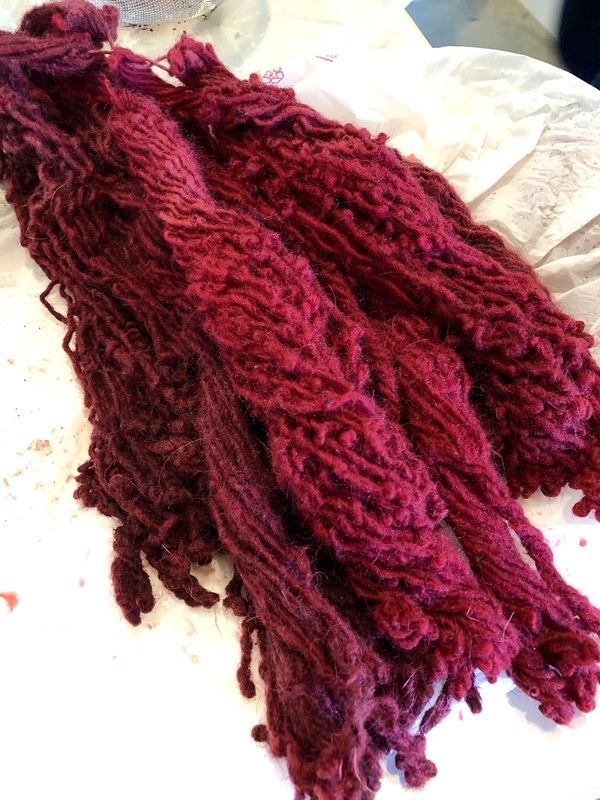 He is a weaver and natural dyer from Teotitlan del Valle, Oaxaca, Mexico. 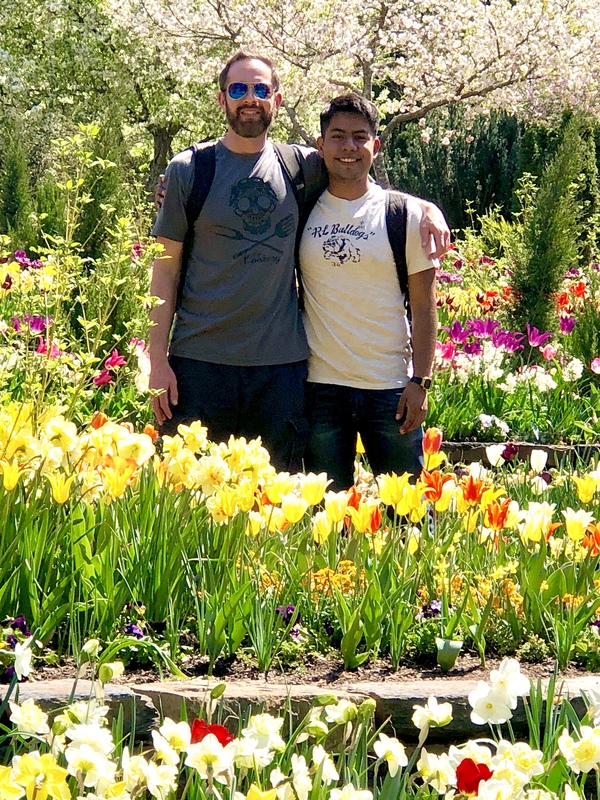 Last year, he graduated with a degree in industrial engineering after studying for four years at Anahuac University in Oaxaca. He is at a cross-roads. Fayetteville, Lillington, Coats, NC friends give Omar a warm welcome in Durham. Thanks Becky, Robin and Debbie for your support. 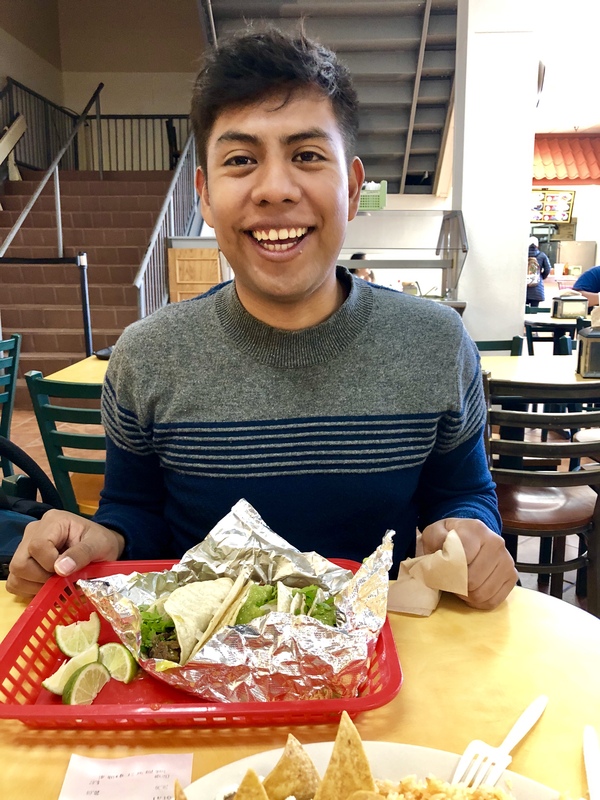 Does he pursue a professional engineering career and move to Monterrey or continue in the generations-old family tradition of his Zapotec culture? On March 1, 2017, Omar went to Mexico City for an interview appointment at the US Embassy to follow-up on his visitor visa application to enter the USA. He is male. He is young. We didn’t know what his chances would be. Slim, I thought. Very slim. So few are allowed to enter. I wrote my Congressman G.K. Butterfield ((D-NC) to ask if they would send a message and alert the Embassy staff that Omar would be there on March 1 to present a letter of invitation from me and Wendy Sease, owner of INDIO Durham. 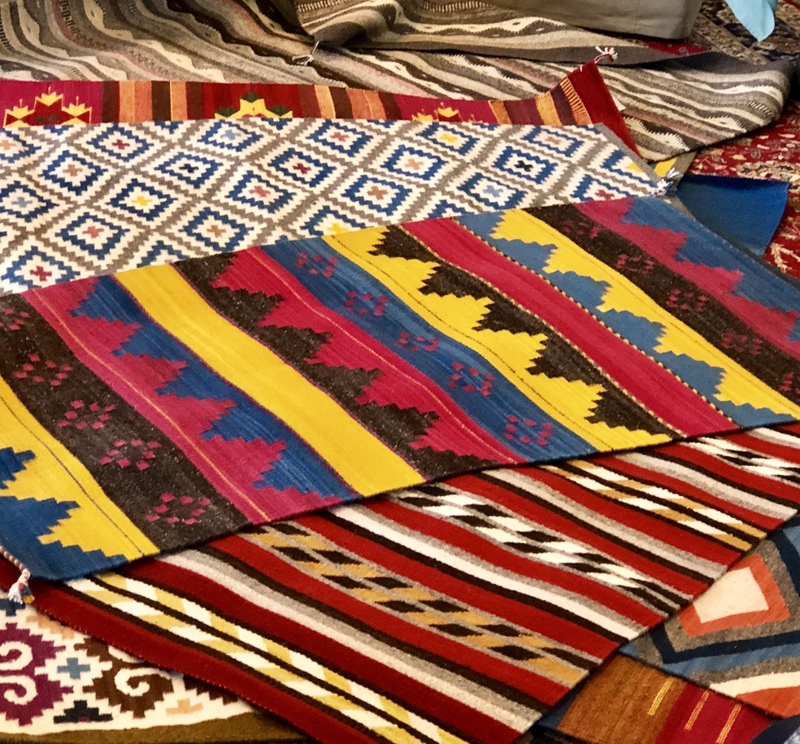 We invited him to give a presentation and sale of the family’s 100% naturally dyed wool rugs in early April. Omar, age 24, has been weaving since he was eight years old. An alert is different from a request to approve. No one interferes with US Embassy immigration decisions. An alert just says, Look out for this applicant. I guess they did. At the end of the short interview, Omar was awarded a 10-year visa. Ojala. 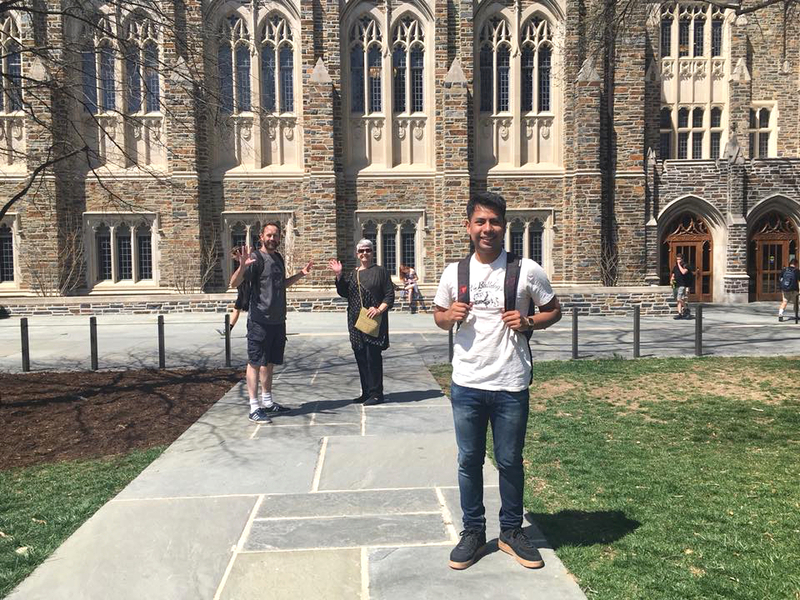 Three weeks later, the paperwork arrived in Teotitlan del Valle, and Omar arrived in Durham, North Carolina on March 28. I started calling this Omar’s Discovery Tour because everything was new to him. Exciting. Inspiring. 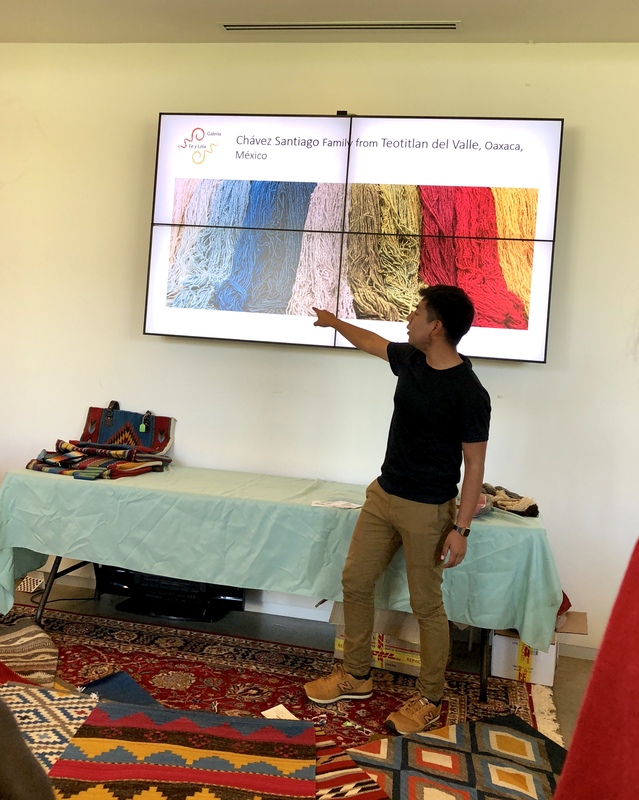 Being here gave him the chance to see that what Galeria Fe y Lola creates in Oaxaca is linked to the home goods fashion cycle in the USA, where most of their clients come from. It connected the dots. A walk through Duke University with Jacob and Hettie. He discovered that design and color preferences change according to season. Texture and palette compliment. He saw traditional and contemporary side-by-side. He saw cities and farmland. Innovation and comfort. 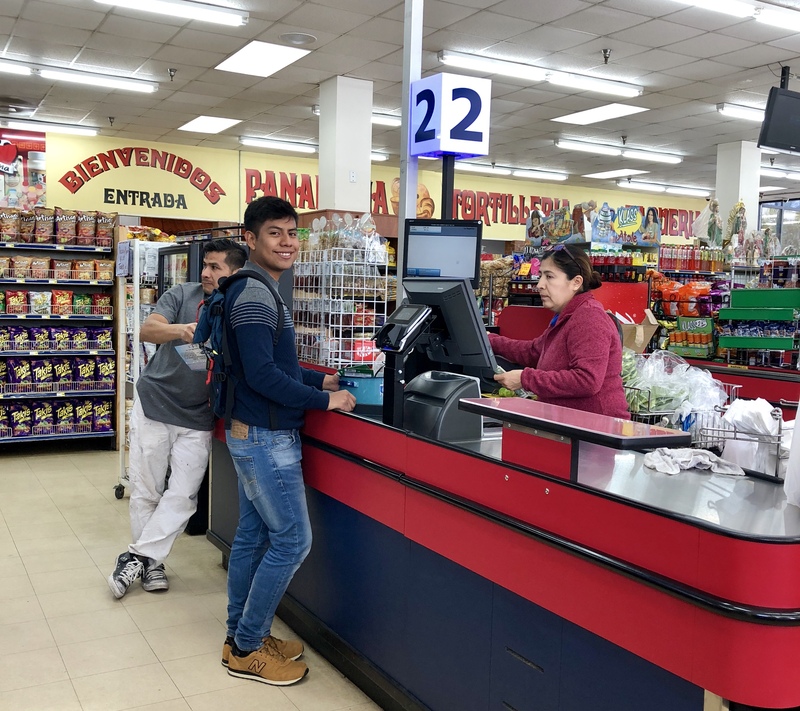 The edges where his countrymen and women live beyond the chi-chi neighborhoods, shopping in grocery stores named La Superior Carneceria or Compare or Tienda Mexicana Guadalupana, where life is familiar and safe. He heard an earful about politics, leadership void and political discontent. 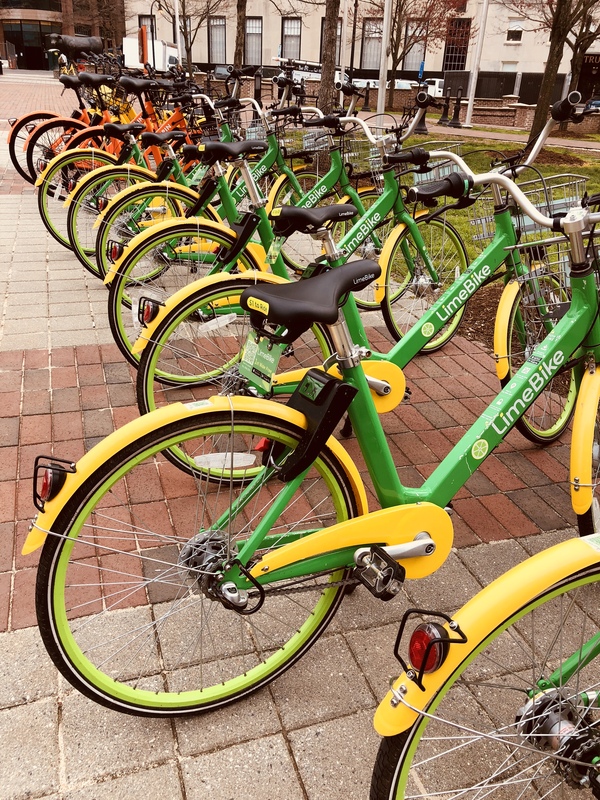 Lime bikes propagate in downtown Durham. Take a ride. 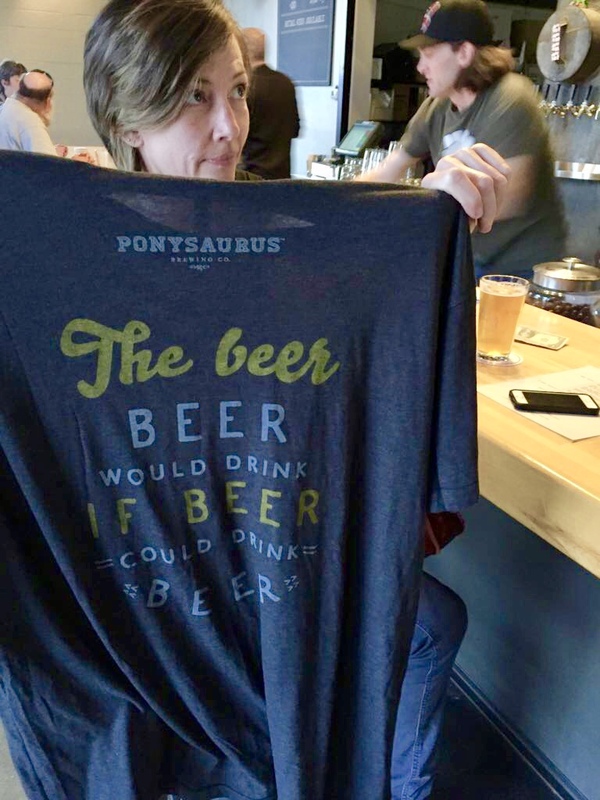 He likes that people here greet him with a smile, that cars stop for pedestrians, and he can ride a Lime Bike on the American Tobacco Trail all afternoon for a few dollars, followed by beer and bonding at Ponysaurus with Jacob and Kathryn. He likes that we recycle (some of us). And, he can put on his jogging shoes and run for miles on groomed paths and streets. It got to the point after the first week that he could rank order the best hamburgers in Durham after tastings at many restaurants. In retail shops, he was invited to sit down in a comfy chair or sofa, offered refreshment, and an invitation to kibbitz informally. He saw that deep friendships can be formed well beyond the inner circle of family. 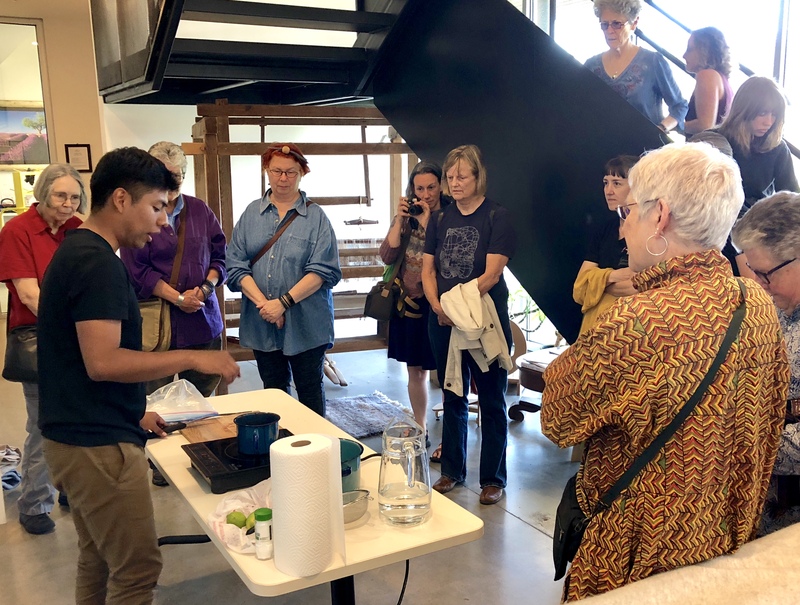 Then, we went to Asheville and Weaverville, where the fiber arts community welcomed Omar for a cochineal dye demonstration and exhibition. We ate at Buxton Hall Barbecue and White Duck Tacos, and walked the downtown going in and out of fine art and craft galleries. He was mesmerized by the creativity. We slept in a cozy Arts & Crafts Cottage on the Blue Ridge Parkway hosted by Laura and Bryan. Omar began to imagine that his dreams could become a reality. He began building new dreams. 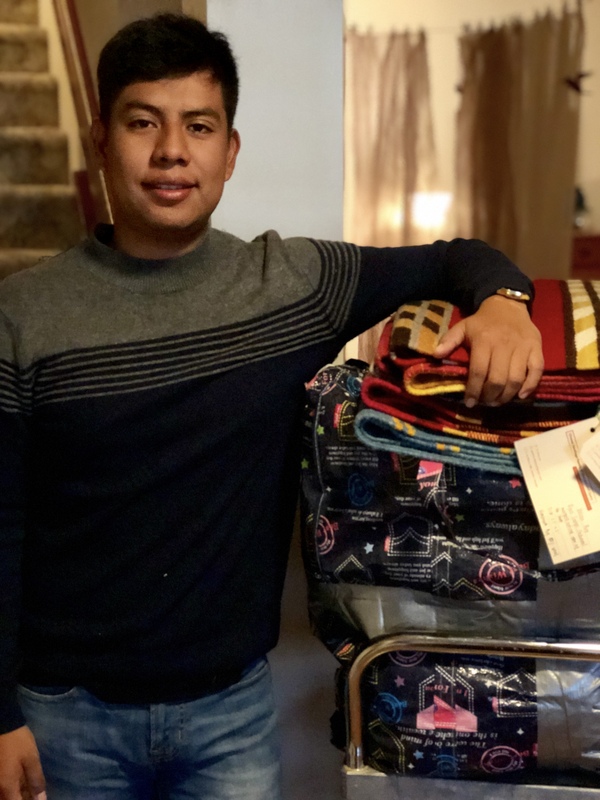 By the time he went home on Saturday morning after almost three weeks here, he was excited and inspired to create new designs, incorporate new business ideas, capture on cloth that which captured his imagination, and incorporate elements of traditional Zapotec motifs with new energy. I wish we could give this opportunity to other talented young Mexicans who have dreams, who want to create and add value to their country. I feel much this way when I go to Mexico. I see that families are tightly knit, where ancient ritual gives meaning to life, how reverence for the elderly shapes continuity, how people take time to be with families and celebrate together. Travel broadens and opens us up to more than new experiences. It gives us something intangible, a new neural pathway to exploration, learning, becoming. It gives us an opportunity to befriend, to connect and to live expansively with meaning. 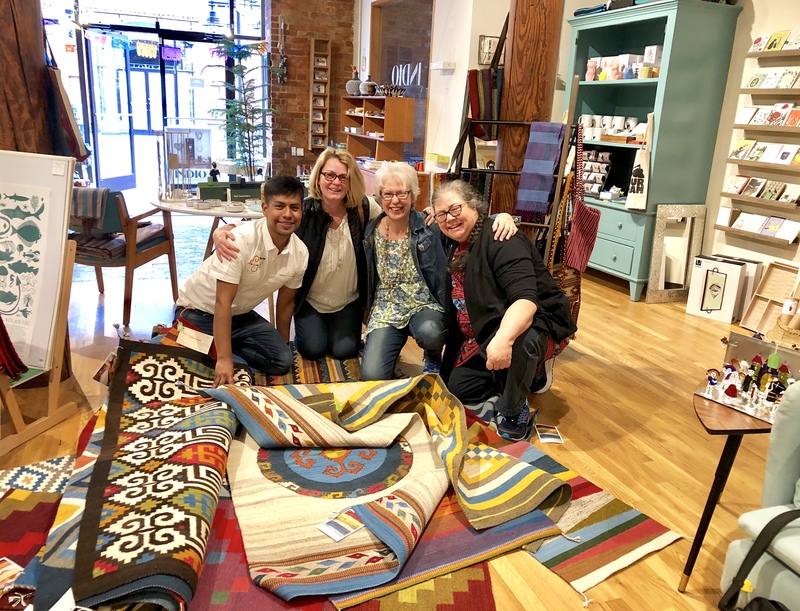 It was twelve-and-a-half years ago when I met Omar’s brother Eric and sister Janet in the Teotitlan del Valle rug market. 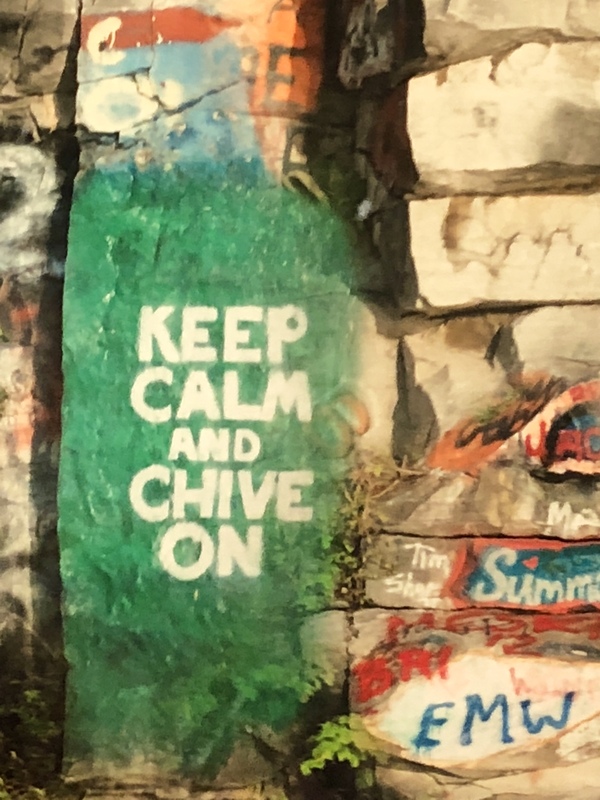 They were both students, not knowing where their paths would lead. Omar was not quite twelve. Through mutual support and effort, our lives were changed. Thanks to all who supported Omar with a purchase! 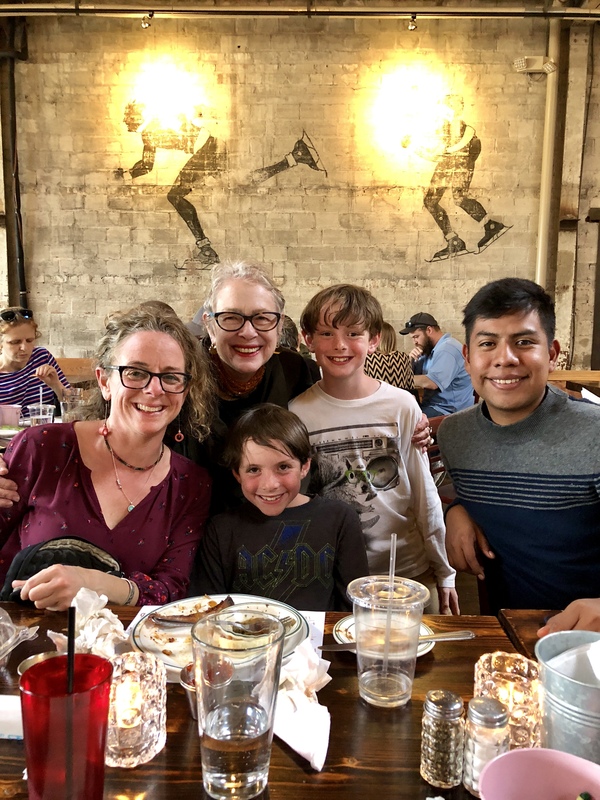 There are many people to thank for making Omar’s Discovery Tour possible: parents Federico Chavez Sosa and Dolores Santiago Arrellenas in Teotitlan del Valle; Wendy Sease, Hettie Johnson, Jacob Singleton, Kathryn Salisbury, Karen Soskin, Steve Haskin, Nick and Rochelle Johnson in Durham; Laura and Bryan Tompkins, Judi Jetson with Local Cloth, Grace Casey-Gouin at Echoview Fiber Mill in Asheville and Weaverville, and our friends everywhere. Thank you. We are talking now about when he may return. We would appreciate it if you would SHARE on Social Media and send on to your friends. 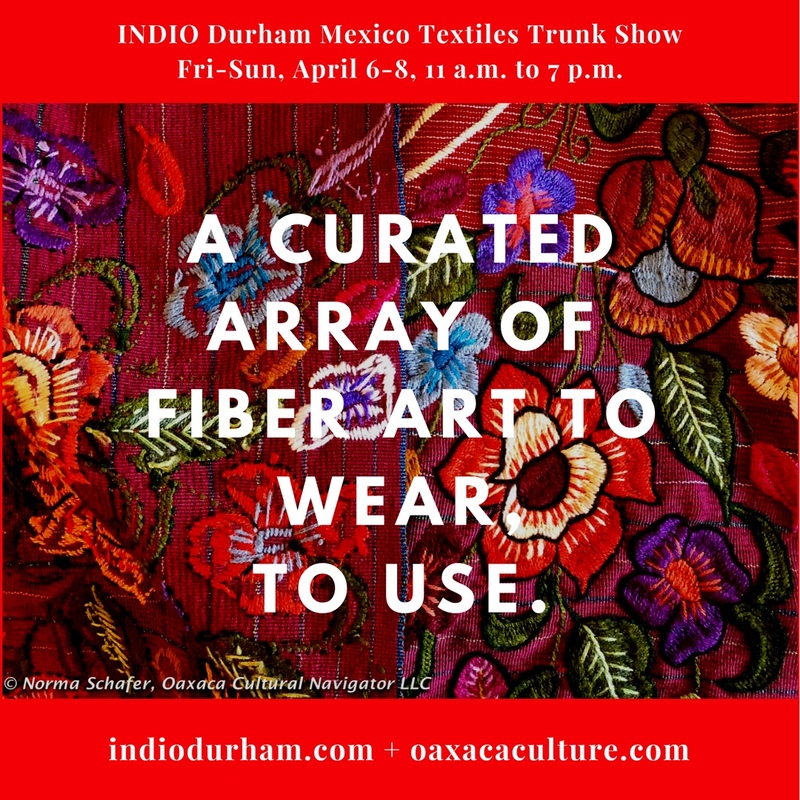 I have over 100 garments and 30 pieces of jewelry to sell in addition to 22 fabulous Galeria Fe y Lola tapestry rugs and Montaño Family handbags. 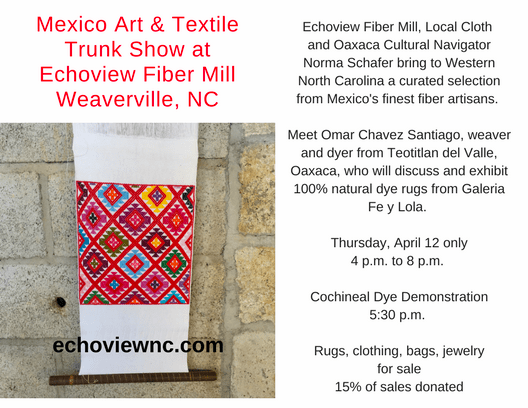 We will be at Echoview Fiber Mill, April 12, 4-8 pm — Weaverville, NC, presented by Echoview and Local Cloth! 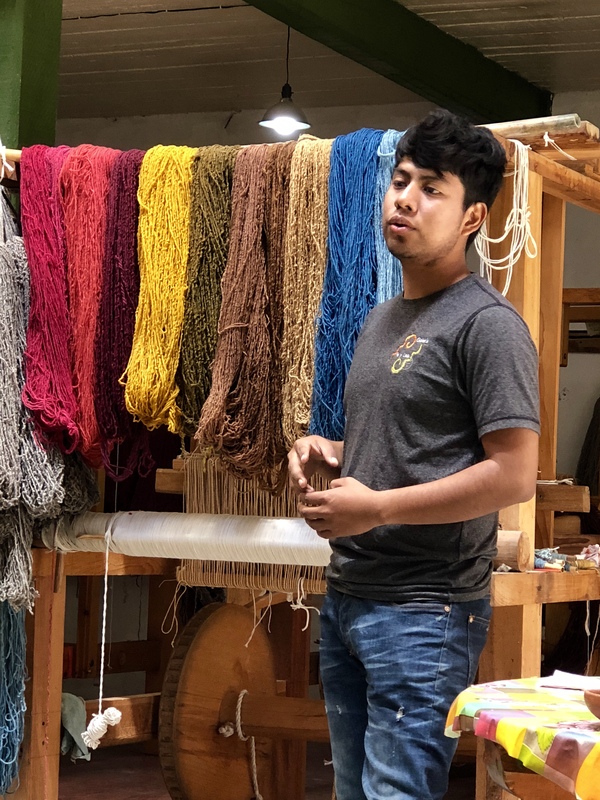 Omar Chavez Santiago is a fifth generation weaver from Teotitlan del Valle who works in natural dyes. His family operates Galeria Fe y Lola in Oaxaca city. I asked my Congressman G.K. Butterfield (D-NC) to alert the U.S. Embassy in Mexico City that Omar was coming on March 1, 2018, for his visa interview. Few are successful. Omar received a 10-year visitor visa. He is here and we are excited. 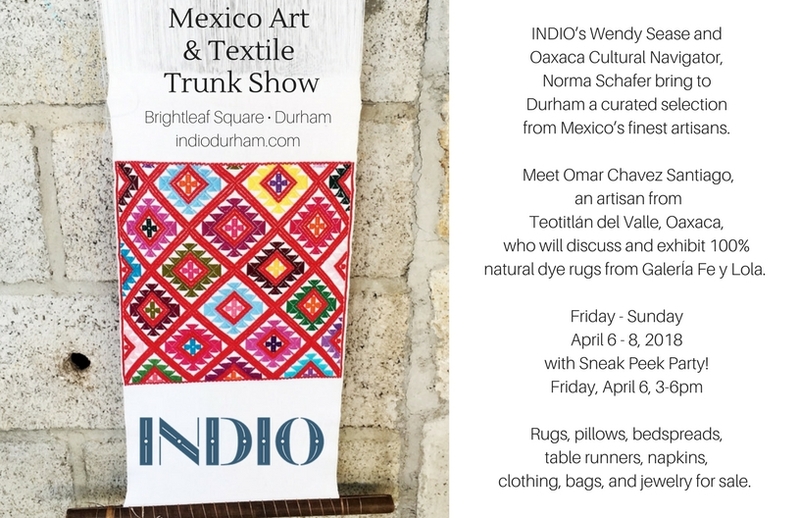 Wendy Sease, owner of INDIO Durham, will host Omar this weekend for a Mexico Art & Textile Trunk Show. Thank you, Wendy. Please come! 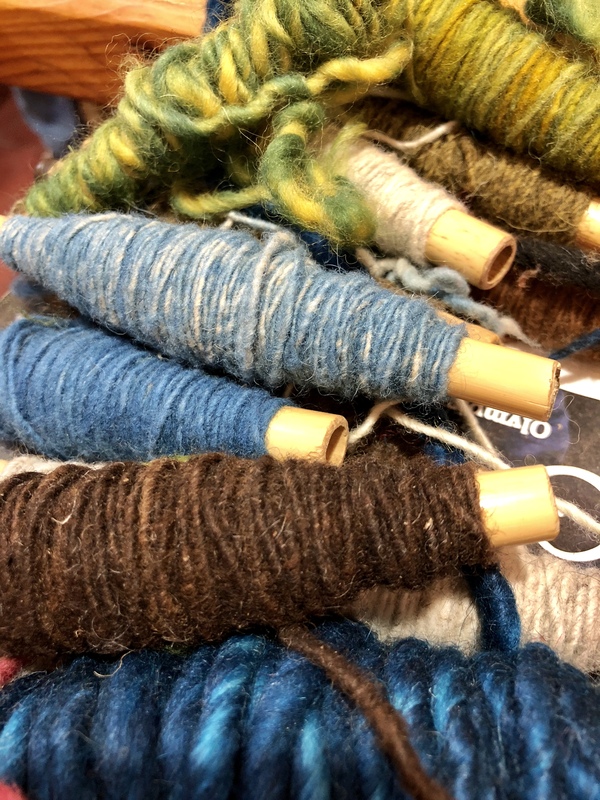 Thanks to Judi Jetson from Local Cloth and Grace Casey-Gouin from Echoview Fiber Mill, for hosting us in the Asheville area. Please let your NC mountain friends know! 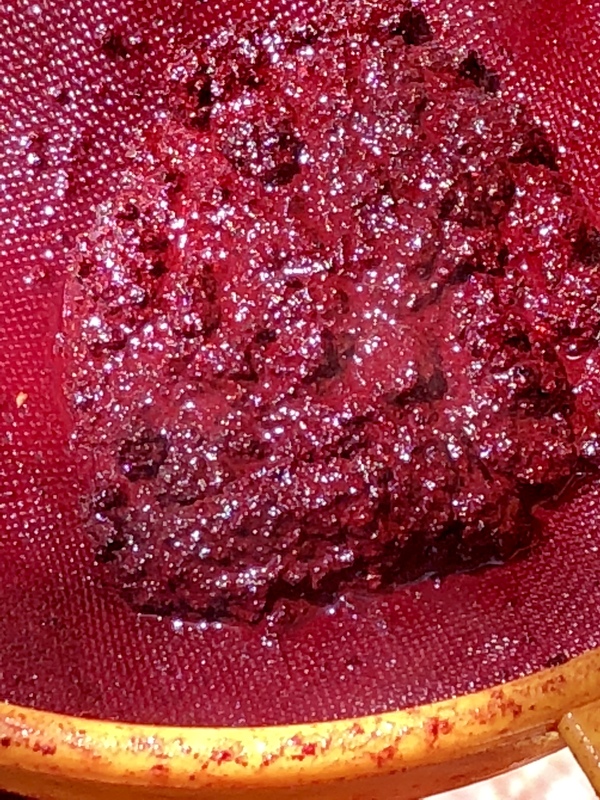 Getting the most intense red possible! Straining the bugs.